The following post is a part of my blog series, The Best of TBW and was originally published on the Babywearing International Blog May 2, 2016. Hanging out by the pool with kids splashing nearby. Enjoying a tall glass of lemonade on the back porch, watching the evening sky. A long day enjoying rides and shows at a theme park. Relaxing with friends by the campfire. Summertime is my favorite time of the year and babywearing has always made it easier to spend time with my family, making memories and having fun. But hot weather can make it harder to keep everyone comfortable and keep you wearing through it all. I am often asked for tips about summertime babywearing and luckily there are some great resources to help people keep on wearing even when the temperatures start to climb. First, let me say this; Having a little human strapped to your body can be hot and in hot weather and climates, it will only get hotter. You can find carriers that are better for hot weather wearing and we will talk a little bit about what features you are looking for in a summer carrier, but most caregivers find that they do not need to purchase a new carrier specifically for the summer time. Dressing yourself and your baby appropriately is the first step in summer wearing and it can make all the difference. The carrier adds layers to the baby, so a lightweight cotton t-shirt and a diaper is usually plenty of clothing in warm weather. With very small infants, remember that they are not very efficient at maintaining their own body temperature, however, an adult body is great at it and as you wear your baby and you sweat, it will help cool your baby. Drinking lots of water and offering fluids to your child often is going to help keep you both hydrated. Another important thing to consider is sun exposure. Make sure you take the time to use sunblock and hats when exposed to direct sun. This great thread has some discussion about how to keep the sun off of your baby while babywearing. A sun hat is essential when in very strong sun, but be sure that the hat you choose still allows for plenty of fresh airflow to your child. Remember you want your baby’s face in view at all times. Wrapping in hot weather is overwhelming to some wearers. Layers and layers of fabric seems like it wouldn’t be something you would want in hot weather, but single layer carries with a thin wrap can make all the difference and allow you to wrap all year long. Short wraps tied in a traditional sling carry are fantastic with medium/thick wraps. If you enjoy a multi-layer carry, choosing a thinner wrap with more open weave will allow for maximum breathability. Check out The summer wrap resource which breaks it all down and has suggestions of different brands that work best in different carries. Another great thread to check out is the summer wrap boot camp. Learn some tips and techniques to help you wrap with thinner wraps — even with bigger kids! Wrapping thin wraps can actually help you become a better, more careful wrapper, so don’t be afraid to try a thin wrap. Ring Slings are a fantastic summer option as they are one layer and come in a variety of fabrics, from 100% linen to a thick dense wrap conversion, generally all of them can be used even in hot weather, because there is just one layer of fabric over baby and wearer and the style allows for plenty of airflow, making them in general the coolest carrier style. Check out this thread about the best blends for summer slings. Mesh water slings and wraps are also available and perfect for wading with little ones. Please remember that babywearing is not to be done while swimming and to use your best judgement when babywearing around the water. There have been a lot of new carriers that have come on the market in the past couple of years, many are hot-weather-friendly featuring cool mesh panels and moisture wicking fabrics. I am often asked if these mesh panels make a difference in how cool the carrier is and the answer is yes, but it makes the most difference for the baby. The caregiver will probably still feel hot, but the baby will be cooler as the heat can escape from the carrier easier. The open sides also allow for more airflow and so meh dais and ssc’s can be a great option for people who want less fabric overall and carriers with thinner/less padding are generally cooler too, so keep that in mind when looking at your options. The SSC/MT Summer Resource is a list that is updated every spring with links to all of the brands and options out there so check it out if you’re looking for a list. To conclude, I want to touch on how to stay safe during the summer while babywearing. As always, follow the labeling and instructions included with your carrier. You should not do anything while babywearing that you wouldn’t do while carrying your baby in your arms. These include things like horseback riding, biking, ATVing, boating, SUPing and water skiing. Choose alternate activities like hiking or splashing in the sprinklers or at the splash pad. I touched on swimming a bit already, but always be mindful around water. Babywearing can be great if you’re wading in the shallow end while watching your bigger kids, but always have an action plan and have an extra adult nearby just in case. Have a safe and cool babywearing summer! The following post is a part of my blog series, The Best of TBW and was originally published on the Babywearing International Blog March 28, 2016. Imagine learning to use a woven wrap without YouTube video tutorials, without a local group to get you started, or without a local educator to provide one on one instruction. I know it sounds overwheming – and it was! In the early days on TBW, the babywearing community was doing just that. We were finding a love for wrapping, and boy, oh boy, did we find it. Choosing and Using Wraps, Chatter – Wrappers Paradise, and Handwoven Geekery – the most active forums – have been the heart of TBW for many years. Collectively, these three forums contain over one-hundred thirty-two thousand threads and that number grows daily. In this installment of The Best of TBW, we will talk about wrapping. The wrapping rabbit hole is a deep one on TBW with tons of history and information. But let’s start at the beginning with the oldest wrapping thread on TBW. There isn’t really much that’s remarkable about this thread, except that it is indeed the oldest. It was posted December 5, 2003, a little over two weeks after the initial launch of TBW. It’s a simple question about tying a wrap, and the answers are just as simple – a humble beginning for what has become a fairly complex series of positions, carries, variations, and finishes. The next thread on the list is actually a series of threads. In the winter of 2007, a simple concept was born, and quickly took the shape of the Carry of the Week Series. It has now run for more than seven years and covers seventeen sessions on TBW. This is the place where many old timers learned to wrap, perfected our carries, and experimented with variations. Many of you might see this tradition living on in “Carry of the Week” or “Carry of the Day” series on facebook, Instagram and in local babywearing groups. It’s a highly effective way to learn to wrap. There are tons of wrapping resources, but I have a couple of favorites to share. The first is The Wrappers Visual Glossary. The second is The Wrapping Cheat Sheet. These threads together lay out the elements of wrapping and break carries down into steps. If a wrapper is familiar with these elements, they can put them together into a freeform carry, which is a fun way to experiment with wrapping and how many carries their and variations came to be. Wraps are woven textiles; some are woven by machine and some are handwoven by artisans, but one thing they all have in common is that they are all unique. A great thread to learn about what is normal and what isn’t is A guide to knowing what is normal for wrap conditions and characteristics. When you have the inevitable pull or broken thread, knowing how to fix it is a basic skill every wrapper should have. The IBC2014 Woven Repairs Workshop is a collection of links and information about making simple repairs. The geekery runs deep on TBW and Wrappers Paradise contains a lot of very specialized information. Ever wondered when and why we started to weigh wraps? We have a thread for that. Ever wondered what wraps exist in a certain color? We have a thread for that too. How about the basics (and not so basics) about woven weaves? Check these out! Wrap Weave 101, and Wrap Weave 301. The wrap forums are also home to many social threads. What did you wear today? (WDYWT) where you can check in and say hi, track your wraps monthly thread, where you can list your stash and track your usage. You can also squeeee about fluffy mail, Talk your friends out of their ISO’s, ride the wagon, or find support while you destash. If you want to just jump in and ask a question or chat about your wrapping experiences, please do! You are among like-minded wrap friends here – and there is no such thing as a dumb question or topic. I often get into the wrap forums and think to myself, will I ever get to a place where I have read every thread in here? The answer is no, probably not. But I will keep trying because they will always be one of my favorite places in the babywearing community to talk wraps. The following post is a part of my blog series, The Best of TBW and was originally published on the Babywearing International Blog January 25, 2016. In 2006, a Babyhawk meh dai was my very first carrier purchase after joining TBW. Meh dais have remained one of my favorites carrier types because they are comfortable and easy to use. In this third installment of The Best of TBW series, I will discuss the influence that Asian Style Carriers have had on the western babywearing community and share some classic threads from TBW about the Meh Dai and two of it's popular cousins, the podaegi/nyia and the onbuhimo. The meh dai (China) is just one of many carriers that make up the Asian Style Carriers (ASC) category. Other carriers in this category are the Hmong (used by the Hmong people who live in the mountains of China, Laos, Vietnam and Tailand), the Onbuhimo (Japan), the Podaegi (wide blanket), Nyia (narrow blanket), and the Chunei (Korea). The modern meh dai descends from the traditional chinese meh dai. The americanized meh dai has a taller and wider body and longer, wider and sometimes padded straps. The most common method of use is also slightly different than it’s traditional counterpart. I am often asked about the name, meh dai. What does it mean and how do you pronounce it? Since the first publication of this post, the #notyourpodbutai movement challenged the anglicized naming conventions of ASC's that were set when they first entered the western babywearing market. We have returned to using traditional names and educating about their proper pronunciation. Meh dai is Cantonese and we pronounce it ‘meh-die’. You can learn more about respecting east Asian tradional baby carriers and preserving the cultural origins of these carriers here: https://notumblr.comtyourpodbutai. Podaegi/Nyia and Onbuhimos have both ridden waves of popularity over the years. These carriers don't have waistbands which makes them an excellent option for high back carries, and while they sound similar to each other, they are very different from one another! The long and rich East Asian babywearing culture has been so influential with it's centuries old traditions that are still ongoing. We have benefited greatly from the influence and inspiration as it has led to the the wonderful variety of babywearing options that we enjoy today. Editor’s Note: This post has been heavily edited and updated from the original post to reflect the current names used for this category of carriers. The Best of TBW - It don't mean a thing if you ain't got a Sling. The following post is a part of my blog series, The Best of TBW and was originally published on the Babywearing International Blog October 26, 2015. “It don’t mean a thing if you ain’t got a sling.” That popular slogan from the early days of TBW sold a lot t-shirts , and for good reason – slings are one of the oldest and simplest ways to wear a baby. Sling carriers consist of a simple swath of fabric that is worn across the body like a sash and is tied, sewn, or secured with rings or buckles. Many cultures use sling style carriers and have for centuries. These slings are often multipurpose garments that are also used for wearing children. In the US, sling style carriers inspired early carrier designers. This patent #US000416970 filed on December 10, 1889 by C.C. Taylor shows a sling style carrier fashioned out of mesh and buckles. The “Suspensory Garment” is just one example of how the concept of the sling has influenced babywearing for generations. There are two main types of sling carriers that are popular with caregivers today: the ring sling and the pouch sling. The ring sling was first designed by Dr. Raynor Garner in 1981. The first ring slings had padded shoulders and rails and had closed tails. This style of ring sling, not to be confused with bag slings, became known as a closed tailed ring sling and are still available for purchase today. Improvements to the design of the ring sling came in the form of unpadded rails, an open tail, and a variety of shoulder styles. As the small cottage industry of ring sling manufacturing grew in the early 2000’s, shoulder styles became very distinct and each maker had its own signature shoulder. To see various shoulders that have been used over the years, check out this thread showing ring sling shoulder styles. Another interesting development in the ring sling category has been with the fabrics that have been used. Many early slings were made from bottom weight fabrics. Lightweight denims and canvases make a sturdy and durable sling, but they can be harder to adjust and not as comfortable for some wearers. Linen and silk became very popular fabrics as they are breathable, soften up nicely with use, and are easy to adjust, but one of the biggest things to happen to ring slings was the wrap conversion. Once called ‘Slingifying”, woven wraps turned ring slings changed the wearing world. This fun thread from 2006 asks the question “Why would I need a slingified wrap?”, the responses are mixed – who could have known that wrap conversions would take over the ring sling world in a big way? Pouches are the second type of sling carrier that we see often today. In the 1940’s -1950’s, two pouch style carriers were on the market, The Pleat Seat and The Cuddle Seat. You can see and read more about them here in this thread; North American Antique and Vintage Carriers from the 1900-2000. Pouch slings in their current form offer a sleek, compact design which has made them a popular diaper bag staple for over 10 years. The tube-style pouch with a curved seam was designed by author Hygeia Halfmoon and was known as the Cozy Cradle. Pouches peaked in popularity when vendors like Kangaroo Korner and Hotslings came on the scene. The KKAFP (Kangaroo Korner Adjustable Fleece Pouch), was a fleece pouch that adjusted with rows of snaps. Hotslings introduced their large range of standardized sizes – making fitting pouches easier than before. The following post is a part of my blog series, The Best of TBW and was originally published on the Babywearing International Blog September 14, 2015. It was the spring of 2006 when I found my community. I was anxiously expecting my fourth child and searching for reviews of baby carriers when I accidentally stumbled upon it. Tucked away in a quiet little corner of the internet, a small group of caregivers had come together to share information about a centuries-old parenting tool now known as babywearing. about babywearing turned up little, Jennifer and Denby decided to build a website to help other caregivers find that information. Jennifer writes, “I had hoped to find some way to compare types of carriers, reviews of brands, a listing of retailers etc. I bought a few different styles on-line to try them out; some that cost me a lot of money, some were well-loved by others (according to testimonials on the vendors’ sites) but many just didn’t work for me or Denby. It was a frustrating and expensive process. The best part of this phase was finding the Yahoo! babywearing email discussion group in about February, which introduced me to lots of new friends and more carriers! After four months of hard work and some bumps along the way, TBW officially launched on November 17th, 2003. The site grew rapidly and steadily; so much so that it required three web hosting upgrades in the first couple months. In 2006, TBW transferred ownership to Melanie (koalamama). The following year, ownership was transferred to Christy (MonteMama). She owned TBW until it was transferred to Crystal in 2010, who owned it until its final transfer to Babywearing International – for safe keeping – in 2013. During all those years, TBW saw huge influxes of members and traffic. TBW boomed with new vendors, carrier styles, and brands. Local communities and babywearing groups found each other in the forums and grew rapidly. Babywearers gathered together on TBW to geek about wrap qualities and intricacy of weaves. To compare strap angles and debate the pros and cons of seat darts. To discuss shoulder styles and construction methods. But it wasn’t all about the wearing, it was also about coming together to support each other. We laughed together, we cried together. We celebrated together and we mourned together. In the past few years, much of the TBW community has migrated off-site to Facebook groups and other popular social media outlets as technology has evolved, but the history of how the babywearing community was built is still there on TBW, where we will hold it for future generations to discover. I am excited to bring you this new blog series, The Best of TBW, where I will share some of the treasures on TBW with you. Whether you are an old school TBW alum, a brand new babywearer, or somewhere in between, there will be something for everyone. This year Disneyland is doing a promotion called "Give A Day, Get a Disney Day." In return for a day of service, you recieve a free one day one park admission ticket to one of the Disney parks. I was so excited to get my kids involved and we signed up for 2 activities. The first one was planting trees and creek restoration. We had planned on taking all of the kids and getting our hands dirty, but we had a rainy weekend so we decided to cancel. 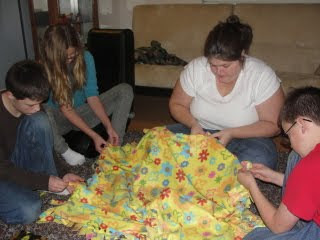 The second one we signed up for was making blankets for Project Linus. 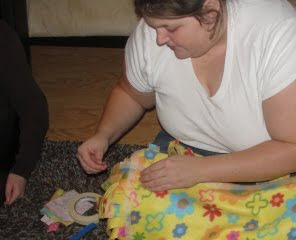 We made five no sew fleece blankets. It was alot of work but a ton of fun. Everyone did their part and the kids learned alot about how to cut straight lines and tieing knots. What a great way to spend a rainy afternoon with our family! Laura removing the tape that we used to get a nice straight cutting line. (L-R) Samuel, Sarah, Laura and Adam tieing fringe. 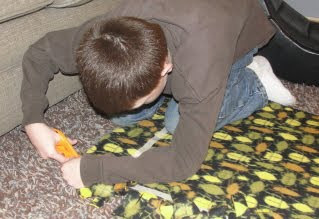 Samuel cutting fringe on the Bug blanket. 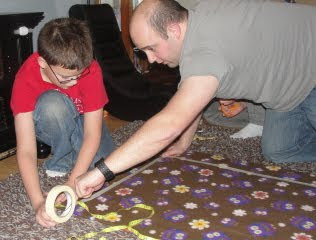 Adam helps Zwieba to tape off the blanket edges. 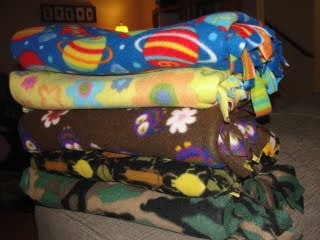 All the completed blankets in a pretty little stack.